Hit It & Quit It: Republic – Eat. Rest. Repeat. It took me a few weeks to decide how I wanted to write about this place…. 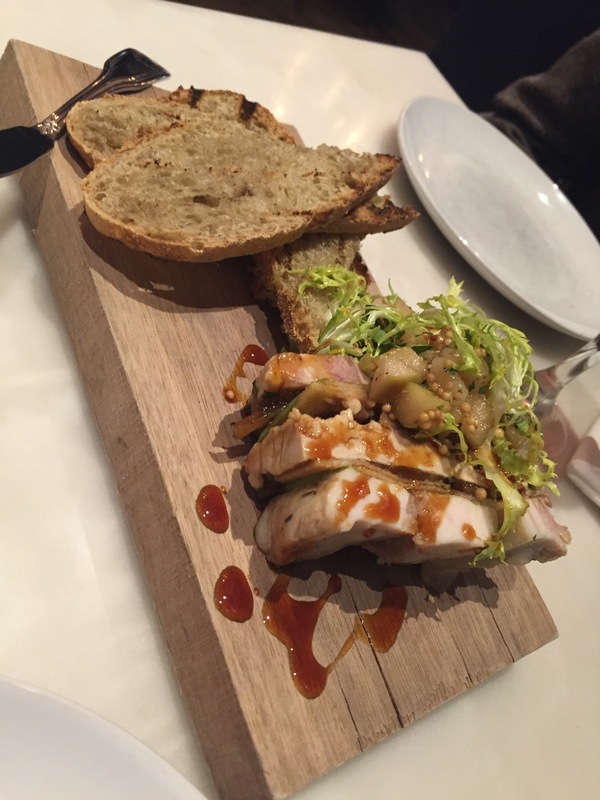 The food was trendy, and though some of the dishes tasted good, there was nothing that astonished me or my husband to want to go back for more. 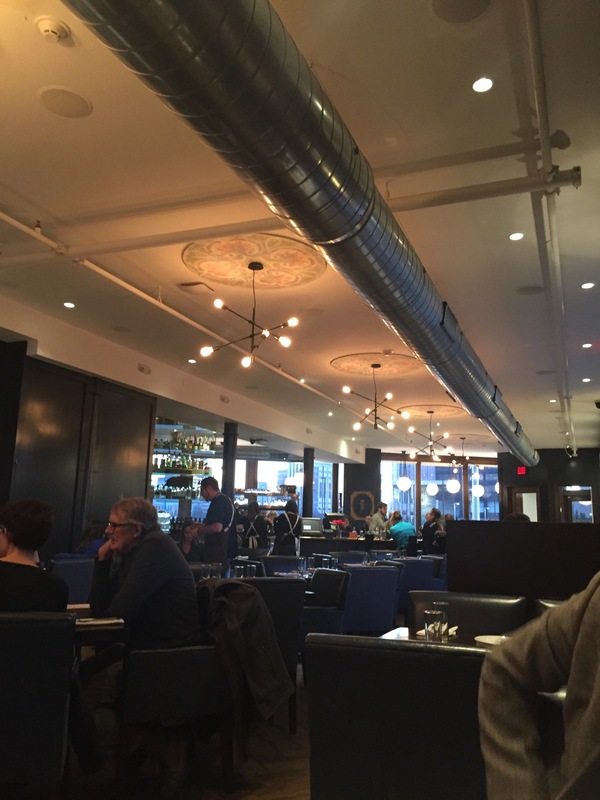 I really wanted to like this place; I wanted it to be another new “go to” Detroit institution with cool food and evolved conceptual dining…..but unfortunately, I had to come to the sad conclusion to categorize it as “hit it and quit it”. They were clearly having an off night, and I suppose that could be to blame, but we were one of the first tables that sat, so I barely constitute any of their excuses as valid. The food took an overwhelmingly long time to come out. Without having to complain, the waitress came around several times to apologize to us for the long wait…. **bonus points for good service. Above is the Foie Gras Terrine, which allegedly featured house pork belly, smoked trout, carmelized Michigan apple, apple mustard, whipped blue cheese, and walnut. 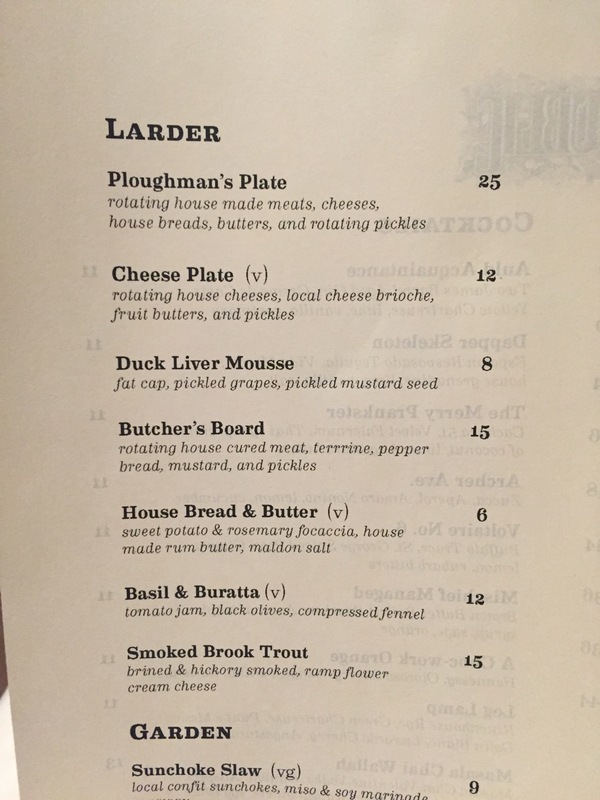 I say “allegedly” because the whipped blue cheese and walnut were nowhere to be found in or around this dish….which quite frankly, is fine with me because I don’t like blue cheese. 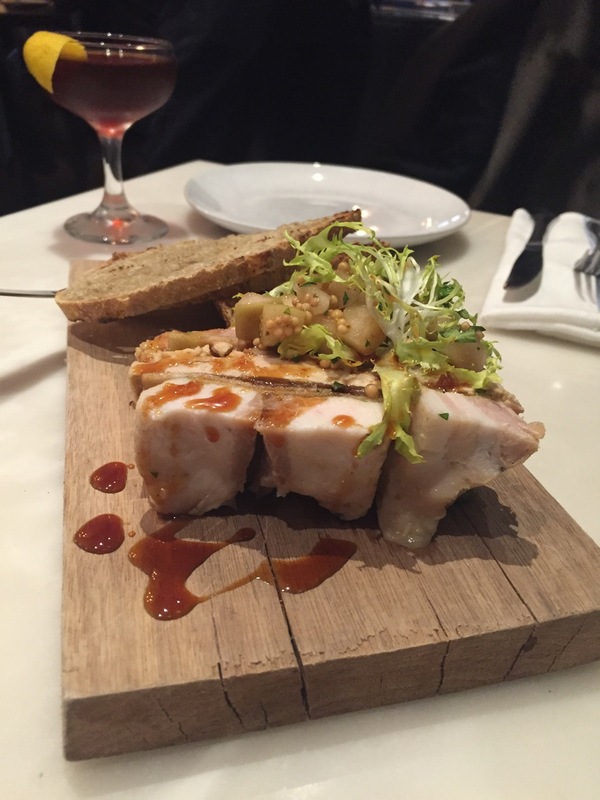 The dish itself was actually quite flavorful, well balanced, and well constructed. Despite my distaste for blue cheese, I was still disappointed in the fact that it took over a half hour to get this plate out to us with missing components. 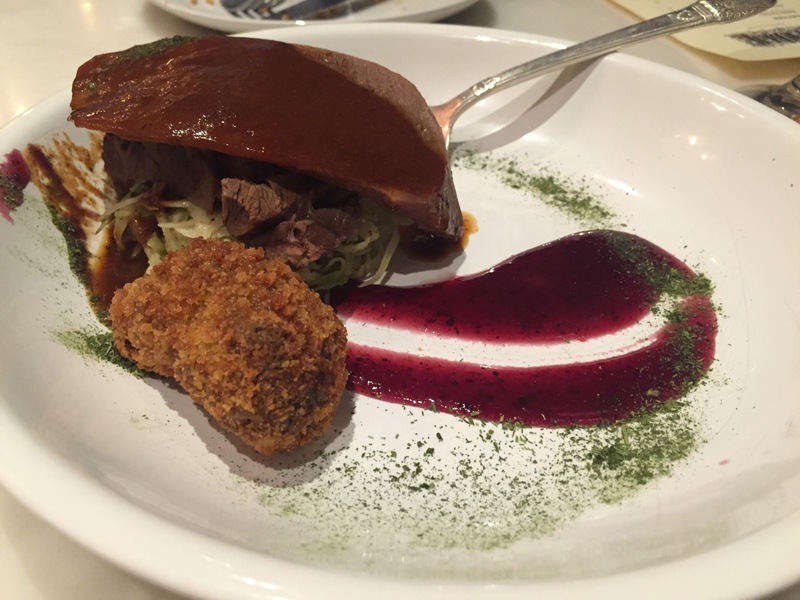 Next we received our order of Tongue & Cheek: pork cheek, beef tongue, caraway slaw, and plum sauce. Meh. Nothing special about this. I appreciate the innovation from a menu standpoint, but execution was sub par. The deep fried pork cheek was bland and flavorless. 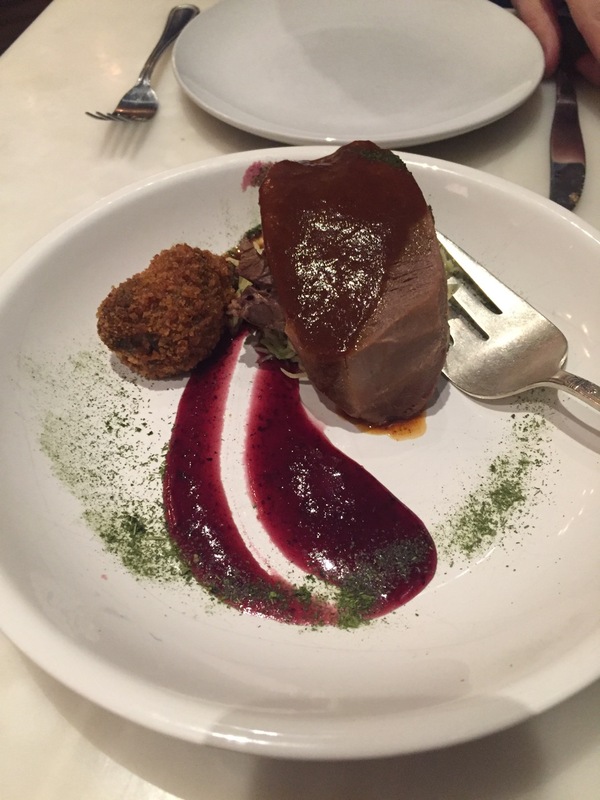 The beef tongue had great texture, but I would have preferred it more thinly sliced. The plum sauce was too sweet, and for me, it just did not pair well. 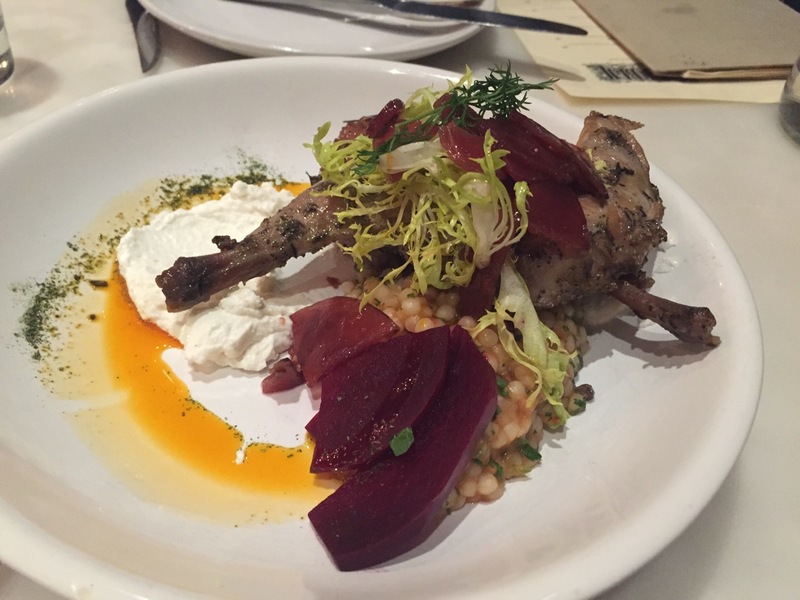 Confit Rabbit: tomato water cous cous, smoked yogurt, roasted yellow beets. They must have run out of yellow beets because I got normal red beets. 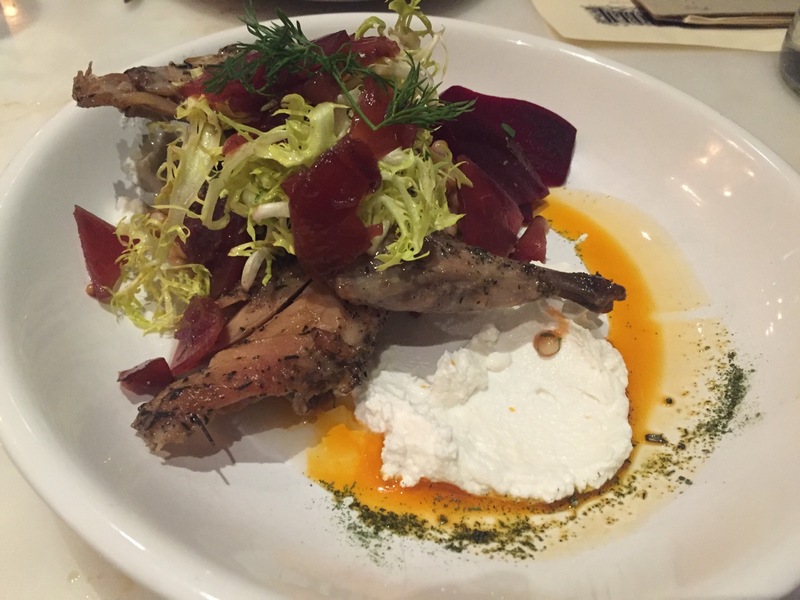 The protein was cooked marvelously, but the “smoked yogurt” did not lend any sort of positive addition to the dish. It was completely unnecessary, as it was too tart and not smoky at all. Either way, it could have been better. In fact, it SHOULD have been better. 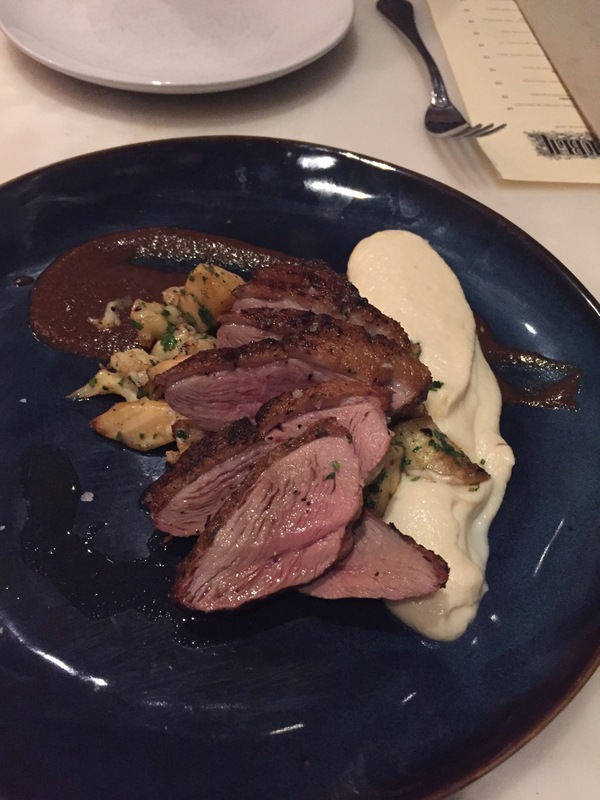 Lastly, the Seared Duck Breast: white root puree, figs, roasted parsnips, black garlic & fig puree. If this was supposed to have figs, I didn’t see or taste any (aside from the puree). 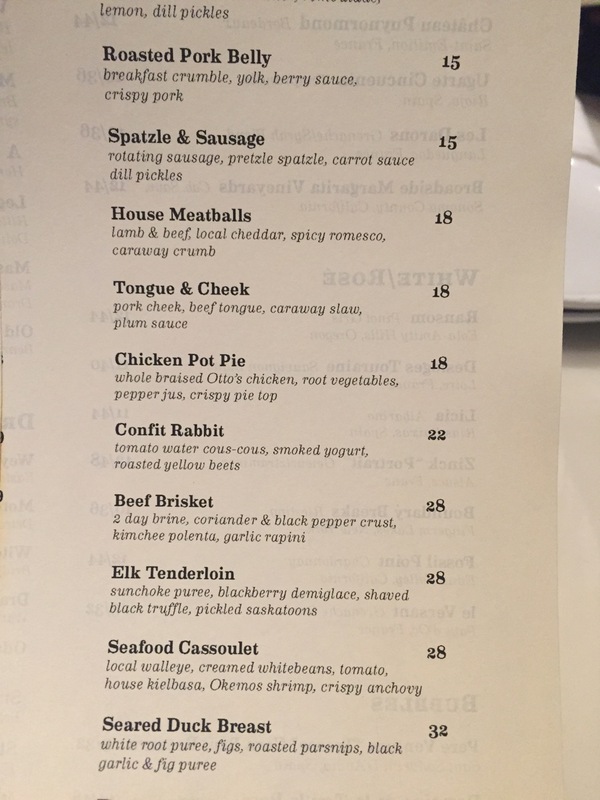 Way to miss an ingredient in yet another dish. I neglected to mention earlier in this post that my husband’s drink, which was supposed to have liquor infused cherries in it, in fact did NOT come with any of said garnishment. #FAIL. This is strike three for the missing ingredient count. They did, however, add cauliflower. I don’t know about you, but I don’t find cauliflower to be a reasonable replacement for figs. The purees were not good….not savory enough…they were just not…anything. I can’t even describe how much the purees were lacking….purpose. Yes, purpose is the only word that comes to mind. Albeit, Republic does a stupendous job cooking their protein. 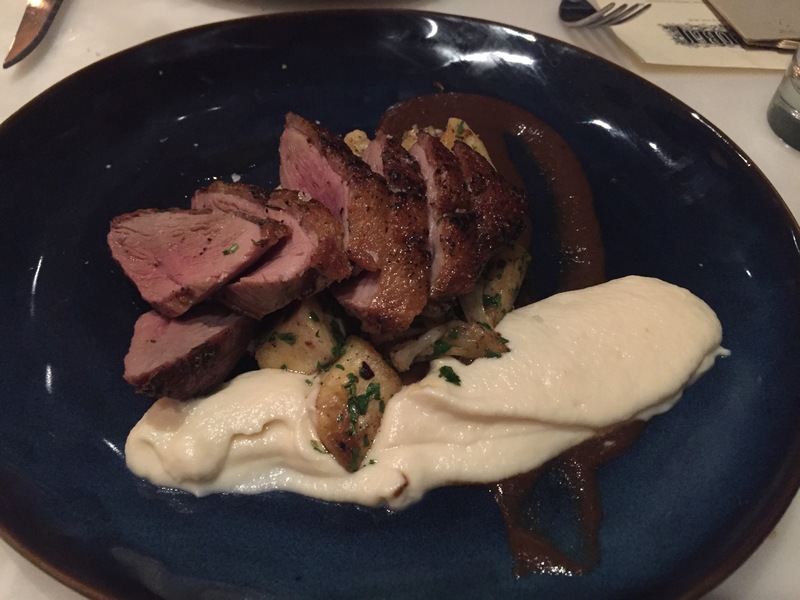 This duck was sooooo beyond tender and juicy AND flavorful….but…..the flavor? The flavor was too reminiscent of breakfast sausage. That’s right, breakfast sausage. If you have had breakfast sausage, you would know that it has a very distinct taste…a taste that was somehow manipulated into this duck. 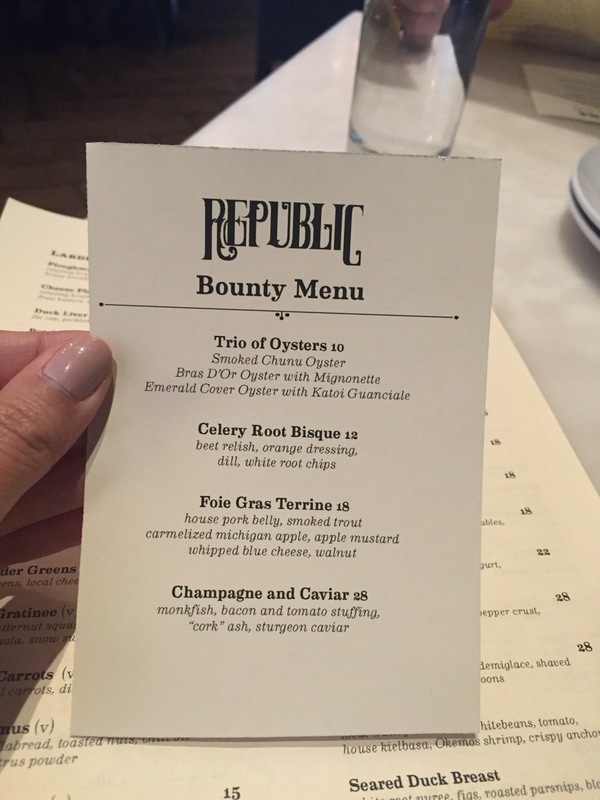 Republic, this duck dish was your last opportunity of the night to impress me…why must you fail so hard? Why did you butcher this beautiful duck into tasting like something I could get at Bob Evans? 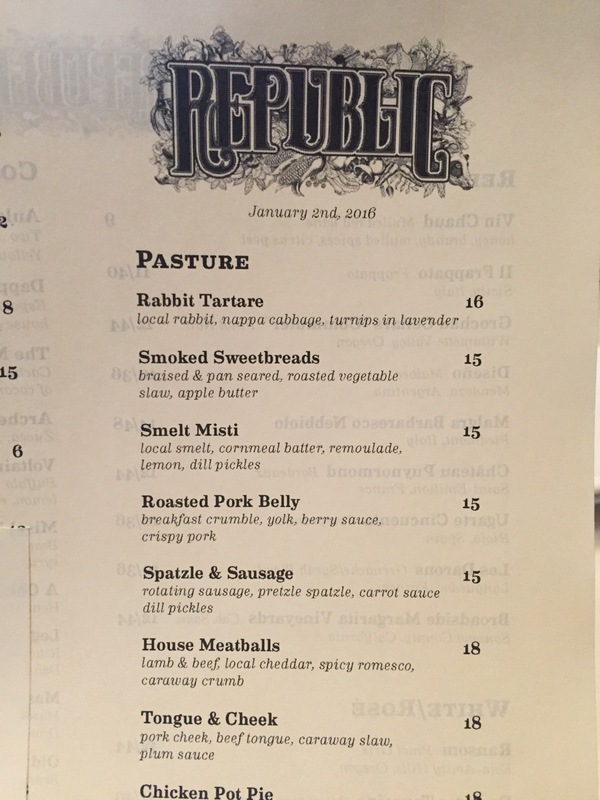 For a restaurant that prints menus daily (notice the date at the top), they should get a better grasp on what is actually on the menu. If you’re going to include miscellaneous ingredients in the description, make sure they actually appear on the dish. Needless to say, after having to re-account for my experience there, “hit it and quit it” is definitely the optimum choice category for this mediocre experience.